Pineapple was first brought to India by foreign traders from South America. Today the fruit grows extensively in the foothills of the Himalayas and is used throughout the country. 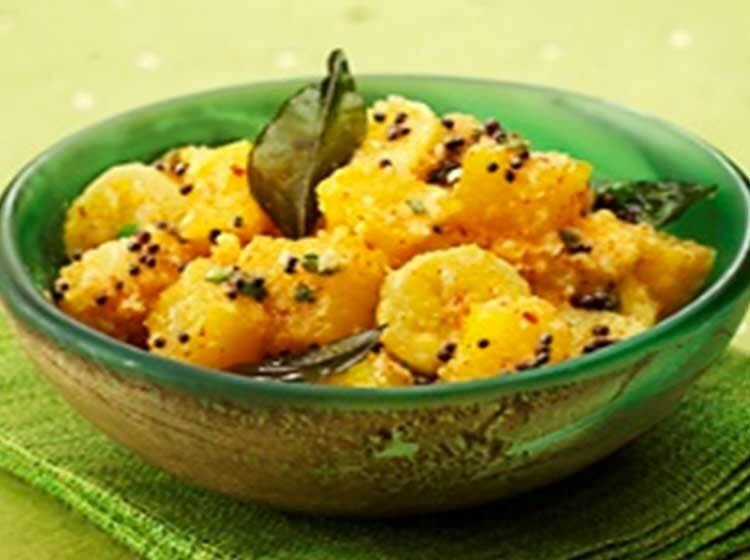 This recipe is from Kerala and is known as ‘kalan’. The natural tanginess of the pineapple provides the perfect background to create an enticing flavour. Peel the pineapple and remove the ‘eyes’ with a small sharp knife. Cut it into 8 boat shaped pieces and remove the central core from each piece. Cut into 1 cm wedges and put into a saucepan with the turmeric, salt and sugar. Add 450 ml water, cover and cook over medium heat until the pineapple is tender (15-20 minutes). Meanwhile, grind the coconut and the red chillies in a coffee grinder and add to the cooked pineapple. Stir in the bananas and remove from the heat. In a small saucepan or a steel ladle, heat the oil over medium heat. When hot, switch off the stove and add the mustard seeds followed by the chilli and curry leaves. Stir these ingredients into the cooked pineapple and serve with plain boiled rice and stir-fried cabbage.